So after the games, I’d drag him a few blocks over from the stadium to sit on a 2nd story patio and eat fish tacos. Eye for an eye, baby. He felt the same way about fish tacos (meh) that I felt about baseball (yaaaawn). I don’t hate it, but let’s be honest here – it’s no football. He grew up pitching in Georgia, where Chipper and the Braves were king. I grew up with Bum, Jerry, and Luv Ya Blue and was a Texans season ticket holder. There isn’t a whole lot that qualifies as “meh” when it comes to fish tacos (but I could fast make you a list about baseball :P). A grilled filet of flakey white fish, a big scoop of a sweet, summery salsa, a pinch of crunchy cabbage, and a tortilla. Forget the margarita and chips. That’s pretty fantastic all on its own. But you know me. I’d never forget the margarita and chips. My supermarket put out a huge case of cantaloupe last week. While they’re not the Texas-grown beauties that will be flooding my market in just a couple of months, they are still completely worthy of an early-season purchase, especially if you’re looking to make a mean salsa or a margarita. We grilled a couple filets of tilapia and topped that with a cool, fresh cantaloupe and pineapple salsa spiked with spicy red and green peppers. The salsa is “sweet meets heat” and a little lime juice and salt pull it together to balance the sweetness. It’s kind of perfect for a warm spring or summer dinner on the patio. Even if you’re enjoying that dinner on the patio with the (yawn) baseball game on. 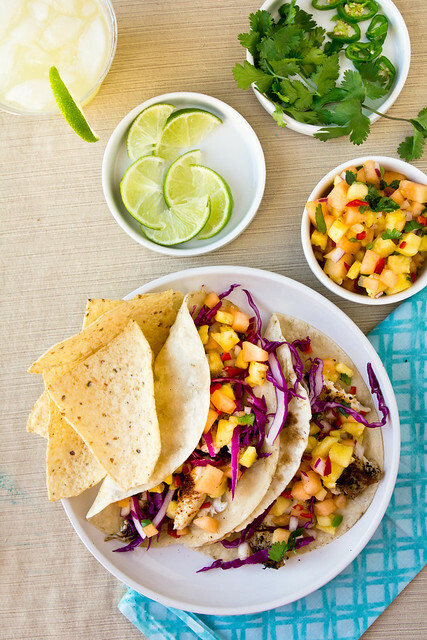 Grilled fish tacos topped with a summery cantaloupe salsa. Stir all the salsa ingredients together, cover, and refrigerate until ready to serve. Brush the oil over both sides of the fish. Squeeze the lime over the fish. Sprinkle salt, pepper, and chile powder over both sides of the fish. Cook ~4-5 minutes on each side, until the fish easily flakes and the center is opaque. Cut the fish into smaller pieces with a fork. Assemble the tacos: place the fish onto each tortilla, followed by a generous scoop of salsa and a handful of red cabbage. I am loving this idea of cantaloupe salsa. I love fish tacos in a big way. This looks completely yummy. Gorgeous photos as well! You had me at “Bagwell forearms” 🙂 but the salsa looks delicious! Cantaloupe and pineapple! How fresh! What a great salsa to go with the tacos, it sounds really fresh and lively. 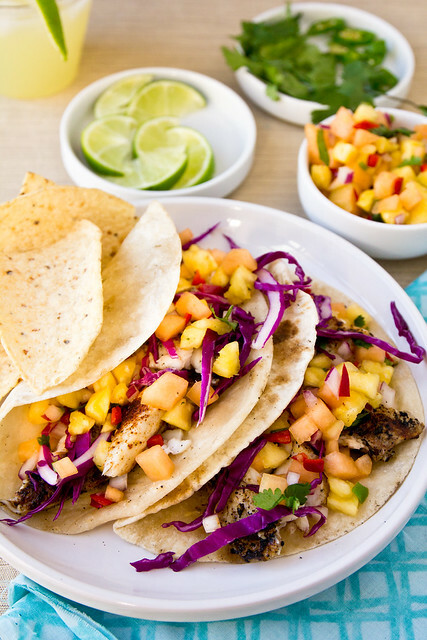 You had me at cantaloupe salsa… Though I don’t think I’ll be using it on a fish taco, as I prefer mine fried baja style. I do think that it would go amazingly well with some pork loin chops though. We were totally not he same page this week 🙂 I just made fish tacos the other night too! 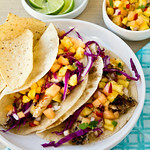 LOVE your cantaloupe pineapple salsa! I’ve never heard of that combo, I definitely need to try next time, looks so good! And such pretty pics! I just want to reach through my screen and grab a bite. Such a gorgeous shot! Love this idea. I’m so glad you say grilled fish tacos; the fried ones just don’t do it for me. I’ll save my frying for food where it really counts! I think it’s actually kinda perfect to be into different sports…that way you never have to fight over team loyalties or which game to watch! Win. As for his fish taco aversion…nah I don’t get it. That sweet and spicy salsa sounds delicious! These look FAR from “meh” to me! I love Fish Tacos, and these look amazing, especially with that salsa! I’ve yet to try a “fruit” salsa on any type of taco, but now I’m tempted. Hope y’all had a fun cinco de mayo! Thanks for the recipe. Love fish tacos, and love the idea of such a fresh salsa on top. Also, cantaloupe margarita? Say whaaa? I can not wait to try this salsa. Thank you for the recipe. The tacos look sooo good. We made these tonight and they were delicious! The salsa was so fresh and flavorful. I love summer. Exciting dish! Grilled fish, holy smokes!